With four weeks remaining until the State Water Resources Control Board plans to take final action on a river-flows plan affecting the northern San Joaquin Valley, water users are working to negotiate voluntary agreements. 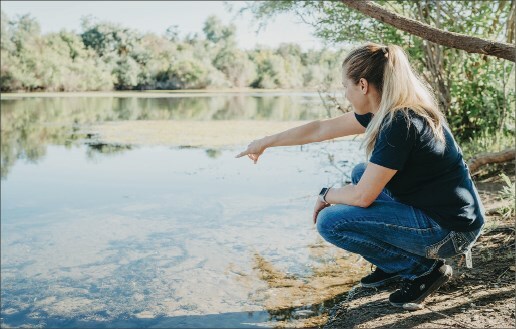 Andrea Fuller, senior biologist for the fishery consultant firm FISHBIO, points out river restoration work for the Modesto and Turlock irrigation districts on the Tuolumne River. Work includes channel and riparian restoration, sediment management and addressing salmon predators. The districts are among the water users seeking voluntary agreements to avoid state-imposed flow plans for fisheries in San Joaquin River tributaries. After receiving requests from Gov. Brown and Lt. Gov. Newsom, the board voted last week to postpone final action on the plan until Dec. 12. The board originally set last week as the deadline to adopt the plan proposed by its staff, which would redirect flows in the Stanislaus, Tuolumne and Merced rivers for fishery purposes. Brown and Newsom, who was elected last week to succeed Brown as governor, requested that the board postpone the vote to allow for further negotiations on voluntary agreements with affected water users. John Davids, Modesto Irrigation District assistant general manager of water operations, said the district has negotiated with the state for several years and is hopeful an agreement can be reached. The district draws water from the Tuolumne River and has said the board plan would cause significant water losses and economic disruption in the area. He said voluntary agreements would be more successful “than anything that would be mandated by the state board” and would avoid “lengthy, costly, protracted litigation” about the flows plan. Michael Frantz, a Turlock Irrigation District director who operates a nursery along the Tuolumne River in Hickman, said he has long advocated for voluntary agreements. California Farm Bureau Federation President Jamie Johansson welcomed the water board decision to postpone action on the flows plan. “Voluntary approaches that combine habitat improvements with well-planned, functional river flows offer the best hope for helping fish while maintaining the water rights people depend on,” Johansson said. Farm Bureau and 53 other organizations urged the water board this summer to reject the staff proposal and to pursue voluntary agreements that would lessen flow amounts but be more beneficial to fish populations. Chuck Bonham, director of the state Department of Fish and Wildlife, and Karla Nemeth, director of the state Department of Water Resources, who have been in talks with water users, told the board progress has been made. “In the last two months, since you gave us additional time, we’ve made more progress than in the last two years combined,” Bonham said. Even though they’re not directly affected by the proceedings related to the San Joaquin River tributaries, water users from the Sacramento River region addressed the board as well. The second phase of the board plan will address flow requirements for the Sacramento and its tributaries. This article is reprinted by permission from the California Farm Bureau Federation.